Security has been among the main storylines leading up to the Winter Olympics, set to begin in Sochi, Russia. Sochi is not far from the city of Volgograd, the target of several recent suicide bombings, and according to The Associated Press, up to 100,000 security personnel have been deployed to guard against potential terrorist acts. A new Pew Research survey finds that many Americans say holding the Olympics in Russia was a bad idea – citing security concerns as the reason. 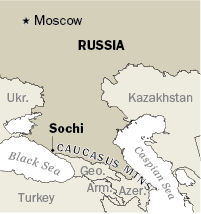 In Russia, attention is focused on potential threats from the restive North Caucasus region, just east of Sochi. The battlefield for two wars between Chechen separatists and the Russian military in the 1990s and 2000s, the North Caucasus continues to be the site of violent clashes between government forces and Muslim extremists. One Islamist leader in the region, Doku Umarov, has urged his followers to disrupt the Olympics. Among Russian adults, a survey we conducted last year showed that about half (53%) think Muslim extremist groups pose a major threat to their country. Russian Muslims – especially those living in the North Caucasus – share their non-Muslim compatriots’ concerns about extremism. In a 2011-2012 Pew Research survey, nearly half of Russian Muslims said they were either very concerned (20%) or somewhat concerned (27%) about religious extremism in their country, including more than half of Muslims in the North Caucasus (33% very concerned, 25% somewhat concerned). The same survey revealed that the vast majority of Russia’s Muslims (86%) reject the use of violence against civilians in defense of Islam. Just how many Muslims live in Russia is hard to say with precision, given that it’s a minority population in the largest country (by area) in the world. But estimates generally range from about 5% to 10% of Russia’s population. Our own Global Religious Landscape report put the estimated number of Muslims in Russia at the higher end of this range, based on a United Nations survey that measured both ethnic identity and religion. While the U.N. survey under-sampled some predominantly Muslim areas, we combined the survey data with Russian census data on ethnicity to try to compensate for this shortcoming. Several general population surveys have arrived at slightly lower estimates for the number of Muslims living in Russia. For example, a 2012 survey sponsored by the Russian nonprofit Sreda found that self-identified Muslims make up roughly 6% of the Russian population. Similarly, a 2008 survey for the International Social Survey Program (ISSP) found that Muslims constitute 5% of the total Russian population. Our own 2011-2012 survey of self-identified Muslims in 39 countries found that 8% of Russians say they belong to the Islamic faith. That survey covered 99% of the Russian population, and included areas such as Chechnya and Dagestan in the North Caucasus.